I bet all of you are really surprised that I'm excited for The Language of Thorns. I mean, it's not like I've mentioned how much I love Leigh Bardugo's work on numerous occasions or anything . . .
And now, we are finally getting a bind-up of the fairy tales mentioned in The Grisha Trilogy, plus some new ones! To sum up: Leigh Bardugo + another book in the Grishaverse + beautiful illustrations! Leigh Bardugo is the #1 New York Times bestselling and USA Today bestselling author of Six of Crows, Crooked Kingdom and the Grisha Trilogy: Shadow and Bone, Siege and Storm, and Ruin and Rising. She was born in Jerusalem, grew up in Los Angeles, graduated from Yale University, and has worked in advertising, journalism, and most recently, makeup and special effects. These days, she lives and writes in Hollywood where she can occasionally be heard singing with her band. Check out my review of Ever the Hunted! I cannot stop flipping out over this gorgeous cover! It's my favorite color AND it's shiny! Ever the Hunted ended on an awful cliffhanger, and I desperately need to know what's going to happen to my ship! It wasn't for everyone but I really enjoyed it! But I love character driven stories. Maybe this one will change your mind? Thanks for stopping by! Ahhh, such pretties! I may need to go back and finish Ever the Hunted. LOL, I was listening on audio and I got a little derailed. 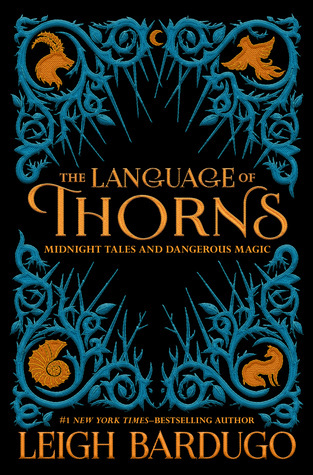 Gorgeous cover for the sequel, though---it makes me think of Disneyland xD Language of Thorns has such a pretty cover, too! Very fairy tale-ish. I love both these picks, Brittany! The cover kind of reminds me of The Grisha Trilogy, which is why I paired it with The Language of Thorns. Let me know if you ever go back to Ever the Hunted! 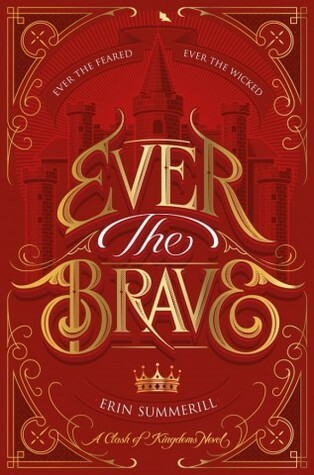 I just LOVE the cover of Ever the Brave. I think I was one of the few who did not like Ever the Hunted, but I still cannot stop admiring its beautiful covers. ♥ AND YES TO THE LANGUAGE OF THORNS!!!! Right? It's gorgeous! And no, you are definitely not alone, a lot of people had trouble with it but I really liked it! And I'm dying for The Language of Thorns!!! Soooooo cannot wait for Leigh's book!!! And ooh the other one is new to me!! Great picks! ME TOO! And glad I could introduce you to it, I hope you'll check out Ever the Hunted! Yay! I hope you read Ever the Hunted soon, so we can discuss! And I'm sure that I'm going to love Bardugo's new book, she has yet to underwhelm me. Great picks, Brittany, these both look amazing! I still need to read Ever the Hunted, and I've only just started Six of Crows, but these two books are definitely getting added to my TBR! Thank you! I hope you read The Grisha Trilogy first but either way I hope you love Six of Crows! Can't wait to see what you think of them! SAAAMMME! And I know! We have to wait so long. Ugh, it might kill me. Right? They are going to be great on display. It's never too late to catch up! Plus, all of her books are amazing! I know, I've finally released my deepest, darkest secret! There is no hiding it now haha. Great picks! I've never read the Grisha series, but it looks interesting! I highly recommend that you do! They are great books and Leigh's writing gets better with each book she writes. Me too! I can't to hold the pretty in my hands so I can pet it and love it forever. And I always drop everything I'm currently reading when I have a Bardugo book in hand. That's like a rule haha. I ADORE Leigh Bardugo!! I'll read ANYTHING she writes, but, if it's related to the Grisha trilogy, I'm even MORE interested!! So I'm adding this book to my Goodreads shelves. As for the second book, I haven't read anything by this author, but I know this is the sequel to "Ever The Hunted", which also has a GORGEOUS cover. So, another one for my Goodreads shelves!!! YAAAAAAAS!!!! Aren't they just? I love them so much and they are the perfect constrast to each other. Everything Leigh writes is gold, period. Thanks for stopping by and sharing your enthusiasm! THE LANGUAGE OF THORNS! Ahhhhhhhhhhhh! I am dead from that cover and we know the inside will be just as wonderful! Stunning picks Brittany :D Eee, I hope you will love them both so so much. <3 And ahhh. I cannot wait for The Language of Thorns :D IT SHALL BE SO GORGEOUS.